Can’t find the right gift or you’re short of time, our Gift Certificates are the ideal solution – a perfect gift for friends, family, and business associates. Our Gift Certificates are easy to purchase – no hassle of shipping your gifts, and research says, gift certificates are the most wanted gift by women. To make it even more convenient for you, we are currently offering 25% off on our gift certificates so this holiday season just relax and give your loved ones an opportunity to select their own gifts! Remember your gift certificates will help in buying products that are making a difference locally and globally. The holiday spirit is in the air and again the time is here to think about what this season means to us – to our families – to our children. Besides delicious food and gifts, this is the time of year when we all want to do good and feel good. Did you know that the gifts that we exchange with our loved ones can be even more meaningful? What would be the best lesson we share with our loved ones this holiday season? Give your gift-giving a new direction this season. Think about a gift that will not only be a fun product for your children and their friends but would be contributing to a good and meaningful project in your own backyard! This holiday season, encourage children to ‘Bring back the Wild’. At Shopanthropic we have a collection of gifts for children that are not only ethically-made and eco-friendly, but are also raising funds for Earth Rangers, the largest children’s environmental organization in Canada. Earth Rangers has an amazing program called ‘Bring Back the Wild’ which has been inspiring Super Rangers – children across Canada who are above and beyond – to help save animals and their habitats. 25% of sale proceeds from this collection will go to benefit Earth Rangers – this means $4 from each journal and $3 from each puppet set sold will be contributed to Earth Rangers. Just imagine how exciting (and fun!) these gifts will be – especially for animal-loving children. 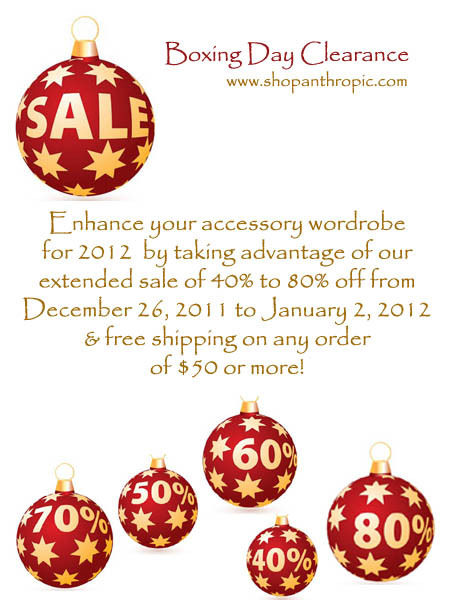 To see products in the Earth Rangers campaign and for other ethically-made gifts, visit www.shopanthropic.com. 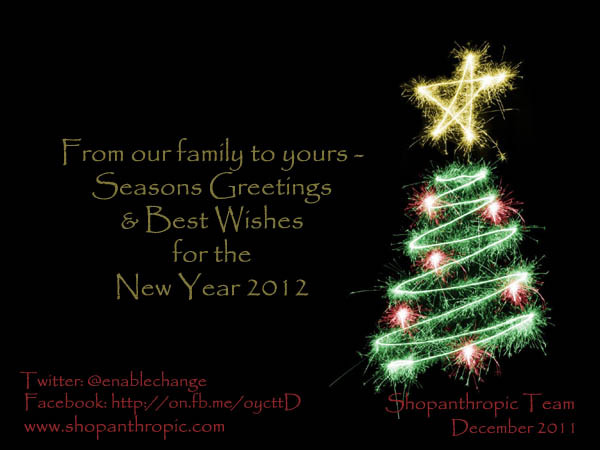 Every gift from Shopanthropic is benefiting artisans globally and charities locally. Besides our promotions, for your convenience, we are offering free shipping on any order of $50 or more. Recently The Wall Street Journal published a special philanthropy section, emphasising on topics such as the ‘Strength in Numbers’ (reaching the masses & looking for small donations) and about ‘Putting Charities to The Financial Tests’ (how is the financial health of a non-profit?). A small donation can go a long way – this is what well-known philanthropists, including Bill Clinton, former U.S. President and founder of the Clinton Global Initiative recently said about the state of charitable giving. According to the BBC News UK (December 1, 2011), More people are giving to charity but the average amount being donated has fallen, according to new figures. There are numerous examples in global philanthropy where small donors are playing a much larger role when it comes to major fundraising efforts. Clearly, in today’s social capital market, the giving pattern is changed and the power of numbers is redefining the philanthropy. Donors are acting like consumers, and they are not only concerned about making ‘a difference’ through their contributions but they are also concerned about the ‘difference’ their contribution is making. With such a mindset and in such a trembling economy, cause-related marketing/purchasing can be a great option where two goals can be accomplished at the same time – invest for a cause while investing in yourself. Though the concept of cause-marketing has been around for years, it has grown significantly since 1983, when American Express partnered with a non-profit group to raise funds to restore the Statue of Liberty. Since then, a number of charitable organizations have been successfully raising funds through cause-marketing. Based on the data from Cone Communications, a public relations and marketing agency specializing in cause branding and corporate responsibility, an overwhelming 94 percent of consumers are likely to switch brands, about equal in price and quality, to one that supports a social issue. This purchase behavior is at an all-time high since Cone first began measuring consumer purchase trends in 1993, according to one of Cone’s cause marketing experts, Craig Bida. Additionally, Cone’s research shows that: Most consumers (91 percent) would buy a product associated with a cause, if given the opportunity; 62 percent say they already have purchased a cause-related product in the past year. Which charity or non-profit organization is benefiting from the cause-related campaign? Exactly what portion or percentage of each product is going to the non-profit? In some cause-related campaigns, a portion goes to a non-profit after a certain number of dollar sales have been reached. In such a situation, what is the threshold figure? Is there any maximum contribution cap? And lastly, is there common understanding between the organization that is doing the cause-marketing and the non-profit that is receiving the contribution? While we can all agree on the power of micro-philanthropy, for cause-related purchases, we must also consider small social enterprises that are dedicating themselves to raising funds for charities & non-profits, in many cases, without any contribution cap or threshold figure to make their contribution. Let’s make shopping the new giving!